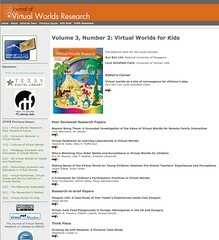 Bernadette, aka hvxsilverstar, alerted the Librarians-In-Singapore list members to a special "Virtual Worlds for Kids" issue of the Journal of Virtual Worlds Research on "Virtual Worlds for Kids". "... We hope this volume of scholarship will provide much needed insight into the ever increasing use of virtual worlds by kids (3-14 years old), which represents a significantly larger market share than virtual worlds use by adults." Incidentally, the journal is licensed under a CC-BY-NC-ND license. The issue's guest editors were Dr. Sun Sun Lim (National University of Singapore) and Dr. Lynn Schofield Clark (University of Denver). I thought the journal articles was timely, in light of recent articles I read about kids and teens not taking to twitter and blogs. The peer-reviewed articles contains lots of thinking points in the context of libraries. "Penguin life has been interesting. It has presented a dynamic backdrop for the exploration of how personal, behavioral and environmental factors have influenced the development of my tween daughter’s social identity, and of how the platform of Club Penguin makes it easy to experiment with identification, and more challenging to read social cues that relate to those identifications." "Racial identification similarly changes, so that young people are challenged to see that race may not be solely related to appearance but may also be related to one’s choices and particularly to the affiliations one chooses. In Club Penguin, race as manifested through the penguin body color is a seen as a legitimate reason for gathering and for exclusion." Those might be reasons to be put into proposal papers, if any library were to put up funding papers for setting up VR environments for kids. On the flip side though, I think the difficulty is in trying to prove those outcomes empirically, on a representative scale. Or in a way that convinces people that if the library were to set up a VR environment for kids, the kids participation will result in those intended outcomes -- and not merely an intellectual observation made in the research context. I can imagine critics asking if kids really go into VR environments to learn about social identity. If they don't, then how would that sort of specific learning outcome be achieved, rather than through chance. Also, a criticism may be that there are other "tried and tested" ways for inculcating the same values. E.g. face-to-face workshops. Those were some "issues" that came to mind, i.e. I could hear the funding panel ask those tough questions. The aim of this paper is to establish a framework for participation in virtual worlds and to test the framework by looking at current participatory practices in virtual worlds. In this paper we present a framework for children’s participation in virtual worlds which is based on research review. Our framework sees children in virtual worlds as social actors, learners of civic participation and as citizens. Results of a survey conducted to find the participatory practices of children in virtual worlds are also presented. The results indicate that children are highly interested in socializing with friends and engaging in avatar related activities. It was also found that traditional forms of civic participation are not very common in virtual worlds. Thus, there is a need to promote traditional forms of civic participation and at the same time look at new opportunities presented by virtual worlds for civic participation. "... Instead, children seem to be more interested in expressing themselves in chatting and other social activities. On the other hand, it has to be remembered that there are always differences between children as well. There were children in our study who reported being interested in expressing opinions and taking part in voting and demonstrations often in virtual worlds. We also have to accept that all children are not interested in virtual worlds at the moment..."
In this article, we have presented one way to look at children’s virtual participation and our study still continues. Based on this first phase of our study, we may argue that children are socially active in virtual worlds, which creates many opportunities to educate children about civic participation and to prepare them as citizens of real world by enhancing citizenship in virtual worlds. However, these opportunities can only be realized when the activities and features for civic participation and education are social in nature and have a fun element to it. Thus, there is a need to carry out further research in order to enhance civic education and participation in virtual worlds. The search for empirical proof continues. Until then, I'd imagine that few libraries would venture into VR environment initiatives for kids as yet. The costs seems to be high. Arguable, perhaps. But costs can be in terms of investment of time and resources. Especially in an economic climate that seems unfavourable for experimentation, I suppose libraries will generally plod along when it comes to straying outside the "tried and tested". The PDF issue can be downloaded via this direct link. The journal website is at jvwresearch.org.